These metal-bodied reels feature Infinite Anti-Reverse for improved hooksetting power and precision retrieves. True to tradition, they're constructed to withstand the harsh saltwater environment, while providing unsurpassed performance in all phases. "Last summer I purchased a Penn 850SS reel for my brother for an offshore tuna trip in Southern California.This is a charter that we hire every summer for a two day trip to chase yellowfin tuna, yellowtail, calico bass,and barracuda.At the same time I purchased another spinning reel for twice the money." "Sturdy reel and very smooth. 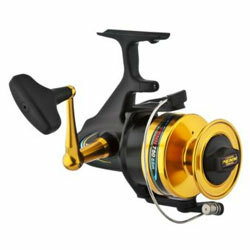 Good purchase and would recommend this to those looking For a reel that has the potential to reel the biG fish in." ""Great Reel I've used it for Ocean fishing as well as pan fishing and I can get the line out where I want it every time."